Natasha pours the truffle molds. After briefly allowing them to cool, she will pour out the center, leaving a hollow space for a creamy ganache filling. One chocolate shop is closing, and another is opening. Truffles & Creams Chocolatier has opened on Pine Street in the same spot where Ganache Chocolatier operated for 22 years. 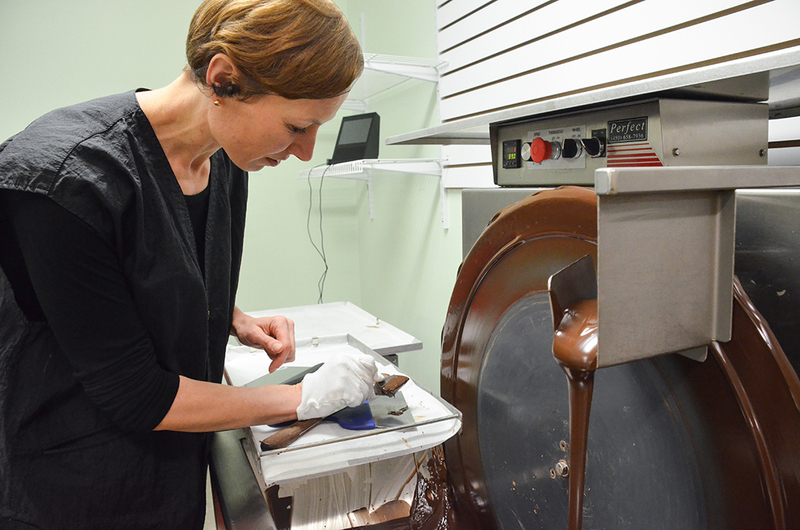 Owner Natasha Hovyadinova learned how to make the confectionary sweets from former Ganache owner Lisa Lueck. Lueck initially wasn’t interested in teaching chocolate-making until she met Hovyadinova and her husband, Sergei Hovyadinov. Natasha said she has improved significantly since the first truffle she attempted. Natasha has a teaching degree but never worked as a teacher, instead focusing on her passion of cooking and baking. She worked at Serenity Café and Tea Room after staying at home with her children for several years. She enjoys making desserts for her family, which prompted her to learn to make chocolate. The menu includes the popular truffles. She will add more complicated varieties and cream-filled options as she learns to make them. Although she had no plans to train the next owner, Lueck said she’s glad that the business will continue. Natasha is already putting her creative mark on truffles. The mint truffle was previously had a drizzle of tinted green chocolate over the top. Natasha’s version has marbled green and silver chocolate. She changed the appearance of the peanut butter and bourbon truffles and added a whiskey truffle. All of the alcoholic versions are now only available in dark chocolate. The couple purchased the shop in September soon after learning it was going to close. “The reason we approached Lisa is because we loved the place,” Sergei said. 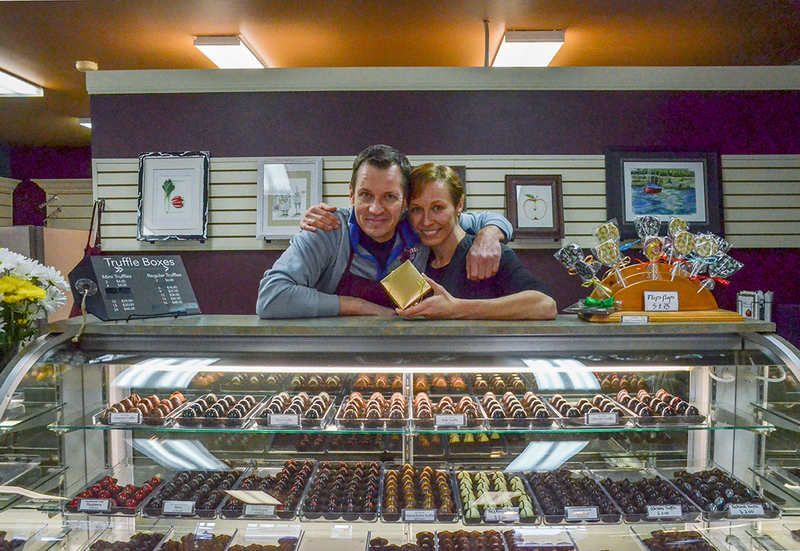 The couple’s passion for chocolate helped fuel their interest. Natasha and Sergei start each day with coffee and a piece of chocolate. “If there is no chocolate in the house, the day is ruined. The coffee is not the same,” Natasha said. The price of individual truffles has not changed from Ganache’s pricing. One part-time and one full-time employee from Ganache will join Truffles & Creams. Natasha also will continue to offer several coffee options throughout the day. Family and friends have served as quality control for truffles as Natasha perfects the recipes. She said at first the biggest challenge was preventing the chocolate from cracking, but her technique is improving. 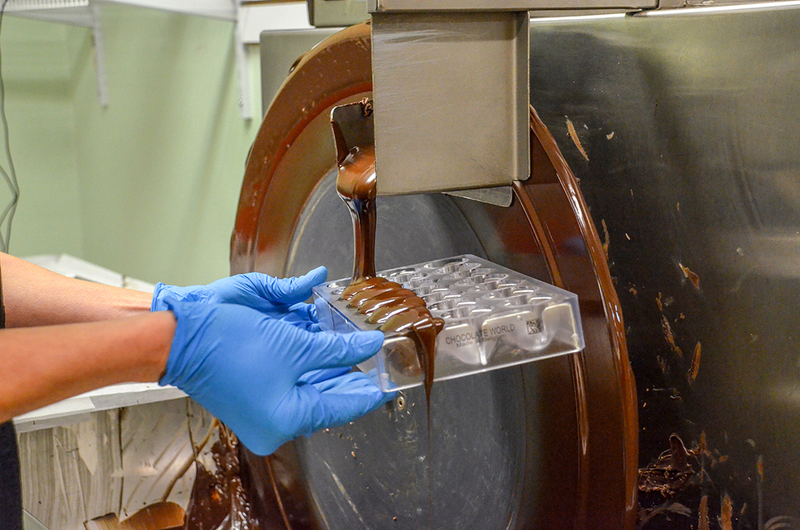 Now, only a few chocolates crack with each batch of molds, which Lueck said is normal. Lueck is now focusing on selling blankets and key fobs, items she once sold at Ganache. Natasha is carrying on the shop’s tradition of selling handmade items. Her paintings are on display in the store and available for purchase. Chocolate truffles derived their name from a resemblance to mushroom truffles. The hard chocolate shell is made with a mold. When hardened, the chocolate is filled with a creamy ganache that is often flavored. Natasha Hovyadinova added her own creative mark to the mint chocolate truffle. The polished exterior is marbled with a green shimmering swirl and the dark chocolate center has a hint of mint flavor. The Kahlua truffle, along with all of the chocolates containing alcohol, is now made with dark instead of milk chocolate. There is a subtle hint of Kahlua in the creamy center. A dab of tinted edible cocoa butter in the chocolate mold creates the silver swirl. The new whiskey variety joins the existing bourbon recipe with a simple identifying drop of chocolate on top. A pronounced taste of whiskey melds with the dark chocolate center. The small chili pepper truffles have a touch of heat and the large version packs a bigger punch. The classic dark chocolate truffle remains true to Leuck’s original recipe and design and was a popular seller.